In recent years, flexible packaging has dealt with a backlash on pollution, until the call for sustainability by industry majors started to lead the way to better solutions for the segment to thrive, with downgauging, recyclability and the use of biobased materials, says Angelica Buan in this report. More than a protective medium, packaging connects the consumer to a product. It also has evolved as a platform for brands to convey their advocacies to certain causes like health, safety, or ecological awareness. Multi-conglomerate Unilever, in a 2017 international study it did, says that 33% of consumers are now choosing to buy from brands they believe are doing social or environmental good. Although sustainability is increasingly becoming a priority for consumers when making purchasing decisions, many businesses have not sufficiently prioritised sustainability and circularity when considering the design, use and disposal of packaging, with the majority of packaging still being of single-use and non-recyclable, says a report by the World Economic Forum. Still, in keeping with the trends, more circular packaging solutions are being developed through biobased materials, downgauging and recyclability. The European Commission’s circular economy strategy for plastics, which targets 50% to 55% recycling rates of all plastic packaging waste by 2025 and 2030, respectively, and other similar initiatives elsewhere, is changing the landscape for the PET segment. While PET material by itself is recyclable and an energy-efficient packaging material (owing to its exceptional capacity-to-weight ratio), further improving on end products adds to the sustainability factor of PET. To this end, UK-based packaging firm RPC Promens Industrial’s commitment to sustainability comes in the form of its new 20 and 25 l PET containers, which are around 50% lighter than other large plastic containers and have been designed to provide maximum pallet utilisation, offering improved transportation efficiencies that deliver a reduced carbon footprint. They are UN Packing Group II, SG1.7 (20 l) and SG1.8 (25 l) approved for the carriage of hazardous goods, and are strong enough to withstand the rigours of the distribution process with no additional outer pack, says RPC. 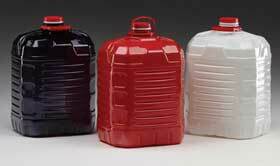 The ergonomic design makes them light and easy to handle and a central neck provides easy pouring with no glugging. The containers are also stackable. 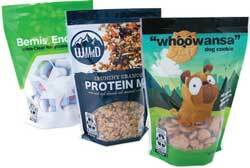 For individual branding, they can be specified in a variety of colours, and there is a large labelling area. In addition, the barrier PET is fully recyclable, meaning the containers have the potential to be used in second-life applications as part of circular economy principles. In the realm of shrink-labelled PET packaging US-based specialty materials company Eastman is dishing out its three new solutions under the Eastman Smart Recycle portfolio, which offer increased recyclability. From the Embrace resins range, Encore copolyester forms a versatile, clear shrink label that can be recycled with PET; and Embrace Float copolyester forms an opaque, low-density shrink label that floats in water and can be separated from PET in the recycling process. 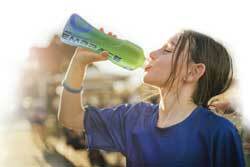 Eastman has also introduced an adhesive, in collaboration with DIC Chemical’s Sun Chemical. It replaces a traditional solvent seam, enabling label removal in the wet recycling process when used with labels made with Embrace resins. Elsewhere, packaging major Smurfit Kappa says it has seen a marked increase in the number of companies seeking sustainable replacements for shrink film for multipacks. Thus, it has innovated the Nor-Grip solution. Assembled in an automated packing line, Nor-Grip is a corrugated solution that securely bundles products, such as large bottles, together into consumer units eliminating the need for shrink film. The recyclable material is assembled by the Nor-Grip Applicator, a machine created by Smurfit Kappa. The company says it is also developing and testing a number of additional products such as the Multipack Sleever sister product, used for smaller products like bottled beer and canned goods that will be added to its shrink film multipack portfolio soon. 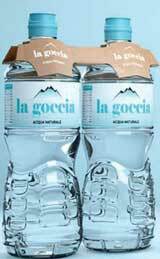 Meanwhile, UK-based RPC bpi protec is providing spring water and beverage producer Radnor Hills’s shrink wrapping of bottled water a sustainable makeover. The X-EnviroShrink film utilises up to 51% Sustane recycled polymer, from RPC, which enables it to combine recycled content with full recyclability. It has a minimum of 31% PCR, and is 100% recyclable. RPC bpi’s recycling plants reprocess over 135,000 tonnes of waste from industrial, commercial, agricultural and domestic sources. Bag-in-box (BIB) film maker Mondi is resorting to downgauging to introduce sustainability. The Austrian firm, claiming it’s the first to offer this innovation, says that it is possible to replace the usual 66 or 70 micron coextruded barrier film structures with a 50-micron coextruded barrier film. 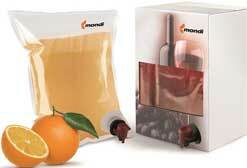 Introduced last year, Mondi says a current customer is already running trials of the new product, adding, “it has experienced no negative impact on machine performance and no equipment changes have been needed to run the film”. Also, since the film is thinner, it is said to yield more running metres per reel. In addition, Mondi says it has also found a way to combine a two-ply BIB construction, comprising a 70-micron coextruded barrier layer plus a 40-micron PE layer into one film of 90 microns, a reduction of 20% material usage. Increasing consumer preferences for portability, easy usage, reusability, and reclosable of packaging is driving the global on the go packaging market forward. However, factors such as product contamination, especially of processed foods are, in lieu of convenience packaging, staggering the market growth. This challenge used to be a main focus in the development of packaging but now sustainability figures as an important benchmark. Biodegradable coffee bean packaging has been produced by South Korea’s Softpack using Plantic, a product manufactured and sold by Australia-headquartered Plantic Technologies. A key feature in the package is the biodegradable barrier layer made by Plantic, with high oxygen impermeability, maintaining food freshness and supporting environmental conservation. Similarly, Koepala, a Helsinki-based takeout food packaging development company, and chemistry expertise company Kemira have formed a partnership to seek out the commercialisation of new packaging concepts aimed at reducing the use of single-use plastics in food packaging. One of the unique elements of Koepala's solution is that the packaging is engineered to be flat. It flexes in to a bowl shape to allow ease-of-use. The testing is still undergoing with both organisations stating that they are committed to finding a viable solution. Polyethylene (PE) is a popular packaging material, but also among the most afflicted with the growing environmental movement against plastics. Thus, introduction of new technologies are expected to improve the product performance. Packaging giant Amcor, which has pledged to develop all its products to be recyclable or reusable by 2025, is leaping past existing flexible packaging for a variety of consumer goods with its new all-PE laminate that is said to offer true, in-store recyclability. Known as Genesis, it is an all laminate that looks and feels like traditional oriented polypropylene (oPP)/PE and oriented polyester (oPET)/PE laminates, with new levels of clarity, gloss and stiffness close to the latter. The introduction of Genesis follows the company’s announcement in September 2018 that it had created a polyolefin-based, flexible film for use in a range of ambient medium and high-barrier, and retort high-barrier applications. 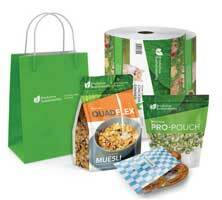 Genesis is pre-approved by How2Recycle for in-store recycling with other PE film products across North America. 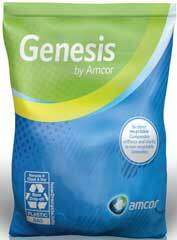 Amcor expects the Genesis product will be popular among brand owners and retailers. 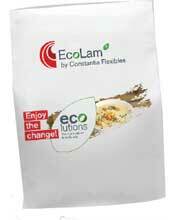 Meanwhile, Austrian flexible packaging manufacturer Constantia Flexibles has developed the Ecolution range that includes EcoLam mono-PE laminate, EcoCover lid and EcoTrainerAlu. With an OPE/PE structure, EcoLam is fully recyclable due to its mono-material structure, and with carbon footprint that is approximately 32% less than that of comparable products. 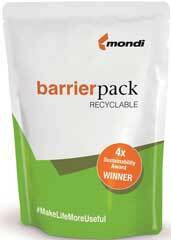 Mondi also has a laminate constructed using two layers of PE film, making it fully recyclable where a suitable recycling infrastructure exists. The firm says that CeDo Recycling, a pioneer in recycling technologies, proved the material’s compatibility via validation trials. BarrierPack Recyclable is ideal for a range of packaging formats and said to be stiffer, stronger and lighter than conventional PET/PE laminate of the same thickness and can be formed directly on FFS machines. US packaging major Bemis Company’s Encore ultraclear recyclable film is made of PE and is available across multiple markets, including dish detergent pods, pet food and treats, confection items and more. The firm says its technology combines readily recyclable material with shelf-appealing transparency. Post-consumer recycled (PCR) materials are gaining acceptance among consumers, owing to the improvements on recycling infrastructure as well as material processing technologies. Cincinnati-based flexible packaging company ProAmpac has developed a tier of sustainable flexible packaging solutions, including one that contains PCR. The suite comprises ProActive PCR; ProActive Recyclable, which includes stand-up pouches, quad seal pouches, rollstock for form/fill/seal applications, sandwich wrap, and more. Others are ProActive Compostable, products that biodegrade in industrial composting facilities per conditions set by ASTM D6400; and, ProActive Renewable, products such as large format bags that are made from a biobased feedstock, such as corn or sugarcane. Elsewhere, US packaging giant Berry Global says it is pushing the limits of PCR content in a variety of consumer packaging under the Verdant packaging brand. It is available now in both stock and custom tubes, bottles, jars, and closures and in a range of resins like PET, HDPE and PP. In the Verdant range, laminate tubes contain with up to 75% PCR; bottles are made from 25% to 100% RPET and jars are available in single, double- and heavy wall varieties, in up to 100% PCR. Berry’s Verdant range also includes continuous thread closures/non-flip tops with up to 100% PCR content and flip top closures with up to 50% PCR content. However, it says that colours are limited where PCR content is greater than 10% PCR.